Doesn’t the title sound intriguing? That is initially what grabbed my attention. The cover is beautiful too. The story did not disappoint either. 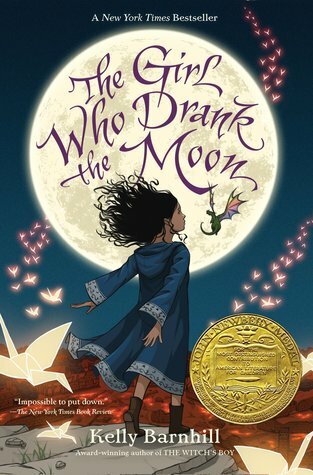 This was the 2017 Newbery Medal Winner, and it was well deserved! There is just something about the tone of this book that I adore. Each year a baby is left in the woods as a sacrifice to the evil witch. That is what people think. The truth is there is a witch in the woods, Xan, but she doesn’t require a sacrifice. She rescues these babies and gives them to loving families on the other side of the woods. She lives in the woods with a swamp monster named Glerk. Fyrian is a tiny dragon, full of mischief and innocence. Trouble begins when she accidentally feeds one of the babies moonlight instead of starlight. Giving a baby moonlight enmagics her, so she can’t be left with a non-magical family. Xan, Glerk, and Fyrian must raise the girl and teach her how to use magic. This book is in a special category of mine. There are only 3 books in this category right now. First is The Tale of Despereaux. Then came The Graveyard Book by Neil Gaiman. Now this one. They are all absolutely impeccable writing. They are told with a story teller’s voice with a strong narrator’s voice. The description is rich with figurative language. Honestly, the writing is almost poetic. When I read a book like this, my heart aches with wishing for the ability to write like this. I can’t recommend the audio version of this story enough! Christina Moore is a Master Narrator! She has distinct voices for each character. Anyone who appreciates masterful writing will like this story. It is a sweet fairytale-like story. It is not a thriller, but it still has a lot of action in the story. People who like the Harry Potter stories would probably like this story. So overall what is my opinion? I give it 5 quills. Hello Mrs. Fletcher. What a joy to have found this site. Thanks for the recommend. I’m off to buy it. Thank YOU tons. Blessings. Selma Writes. I’m so happy to hear you are enjoying my site! Thank you for taking the time to comment! I absolutely loved this book as well! The plot was so intresting and writing itself is majestically poetic. The pacing was slow at the beginning but speed up towards the middle. Great post.